Is your sound system operating at its full potential? Pat Brown will present solid, efficient methods on how to interface and optimize sound systems, including analog and digital interfaces, gain structure, grounding, and basic equalization principles. Attendees will learn the “why and how” behind the numbers in a logical way through demonstrations and analogies. As the name implies, this is the technical part of audio, essential for making sure the audio system’s potential is fully realized. Watch this 3-minute video and click on the tabs below to learn more. Samantha recently attended this training. Read here to get her thoughts. Learning how it works is the key to sound system setup and troubleshooting. Can you logically think your way through all of the interfaces in a sound system? Pat Brown will demonstrate how to measure voltage, impedance, polarity, SPL, and STIPA using audio and acoustic instrumentation. More importantly, he will help you learn what these measurements mean and how to use them to ensure that your system is performing optimally. Pat will demonstrate an optimized method for equalizing a sound system a method that is efficient, logical, and repeatable. Time is money. Learn how to get it done quickly. He takes these hard-to-explain topics and uses lecture, analogies, and active demos to get the points across. If you don’t get a concept on the first pass, you will also hear it from a different perspective. 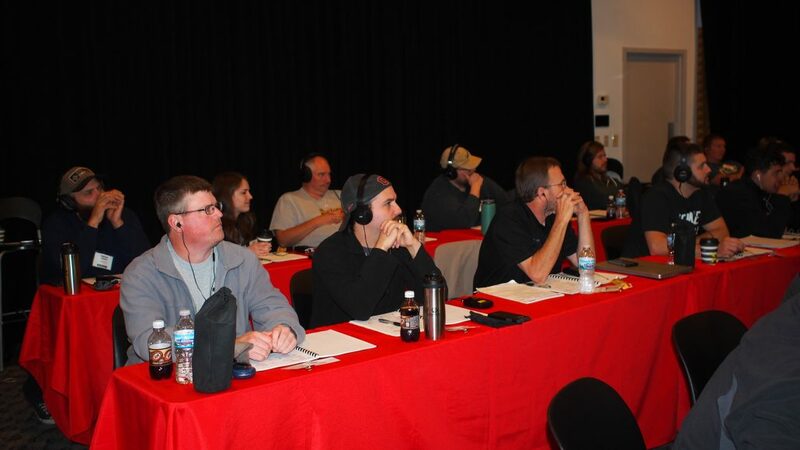 Because of this approach, Pat is known to be among the best teachers in the audio industry. Course Manual – It’s not a manual of PowerPoint slides. It is reference-quality and filled with useful graphics. 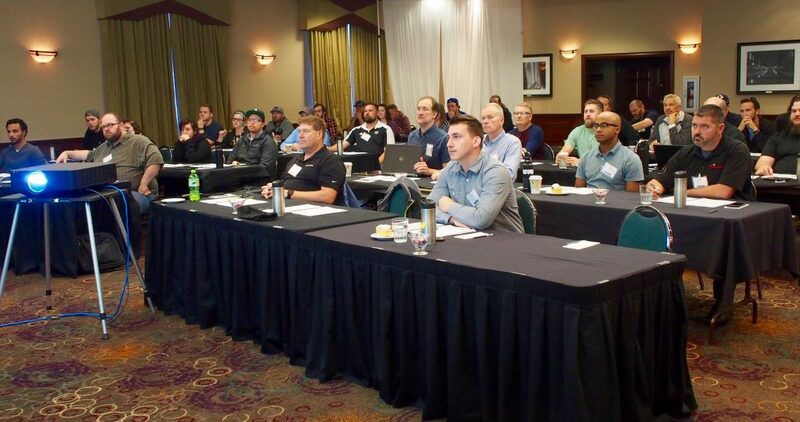 Who Should Attend: This seminar is for those who install, configure, and tune sound reinforcement systems. Enjoy looking at some photos taken during the seminar. One photo was taken at our evening Ice Cream Social. The class starts at 9:00 am and ends at 5:00 pm each day. The doors to the classroom are open at 8:45 am. Typically, we do not end early on the last day. The fee includes the instruction, class materials (full color manual, Audio Click-Rule Windows program, support files, and certificate of completion), beverage service, and lunch. You are responsible for your breakfast, dinner and overnight accommodations. 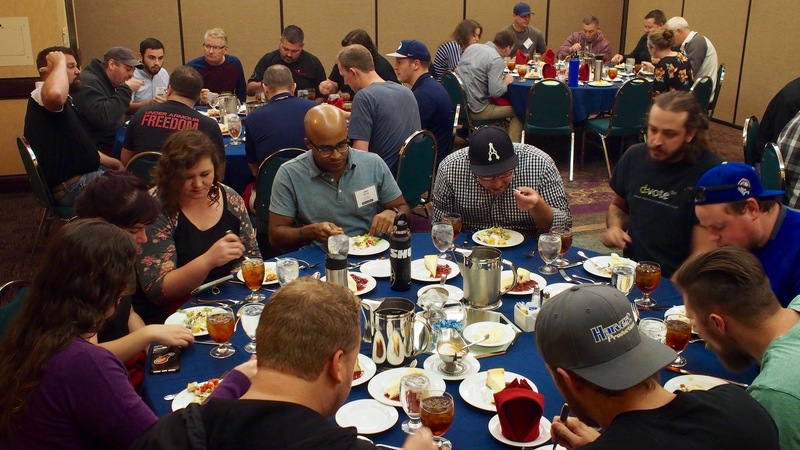 SynAudCon provides an all-day beverage service and lunch each day. Lunch provides a great opportunity to network with others seminar attendees. Pat is just a fantastic instructor and Brenda organized everything so well. I only wish the course was was longer as I enjoyed it so much and learned so much. I’m excited to apply what I’ve learned to my design process to become more effective in my work and add more value to my company. Thank you both so much. S.G. Fantastic Course! I learned so many useful things. Many of the topics expanded on the topics that I already knew, but so much of it was new. I really enjoyed this class and look forward to learning more from Pat and Brenda. M.C. Great to hear relatable real world stories/examples of the principles discussed. R.Z. Great presentation skills and real-world advice to pair along with technical concepts. Much better than reading or taking an online course. J. N.
Very good information going from engineering basics to practical sound / design knowledge. R.F. The seminar wasn’t overly challenging. However, I love hearing the principles in a different way. I am extremely interested in some of the more in-depth courses. Overall, I love the training. Extremely valuable. J.K. It was a great learning experience within the first few minutes. Can this course be more interactive? A.B. I really enjoyed the whole experience. It was very professional and very informative. Pat has an excellent teaching style. Brenda made sure we didn’t have to worry about a thing. Really great experience and I am looking forward to next time. C.S. The first day was pretty much a recap of the “Principles of Audio” online training. It was a good recap. The second day was fantastic. A.M. Loved the demos. Also loved the stories associated with the principles taught. J.U. Excellent Job! I loved it and I learned a lot. Thank you! This info will be very useful in my career. M.B. This was an amazing seminar. This is perfect for many levels of audio people. I am very interested in more advanced seminars. An absolute joy and pleasure to attend. S.B. This seminar really cleared up some concepts that I did not quite understand and I was introduced to new concepts and techniques that I am excited to put into practice. B.L. A little bit rudimentary for my experience in the industry but the review was very good. The mathematical theory and formulas were very cool. Enjoyed the measurement portion and networking with everyone. D.C. So kind and welcoming. Great way to learn! G.T. The class gave me confidence that I was doing it correctly. I appreciated the gain structure presentation. Ground loop presentation was very informative. C.A. Loved the seminar. I believe more demos would help illustrate Pat’s lecture but overall the experience was wonderful! W.M. Pat unlocks the mystery of the technical and help me understand it better. I enjoyed getting knowledge that will help my clients – which will also help my business. S.V. Information was thought out and well communicated. There was a lot of information and it will take time to digest and retain it. J.T. Professional. Organized. Educational. Well done Pat and Brenda. S.S.
My favorite part of the class was: (1) Clarity of the written guide and drawings. (2) Pat’s accessibility and willingness to answer questions. I am a hands on learner and I would like to some hands on demo time with the gear. J.G. Highly useful information presented by an excellent instructor. He used high class presentations, demos and technical content. I learned a lot during the seminar and it is already making a big difference for me at work. The new knowledge that our team has gained from this seminar will directly translate into better products. D.J. I found this class to be the perfect introduction to concepts that are so fundamental, yet not well understood. Having two degrees in electrical engineering, this class was the perfect bridge to understand how the electrical concepts are realized in the audio space. I am so glad I attended!! M.M. Brenda, please convey my thank-you and appreciation to Pat and of course you for keeping everything on schedule. I really enjoyed the class and sorry that I didn’t start attending them sooner. It was very informative. I will use the CAF a lot. M.M. 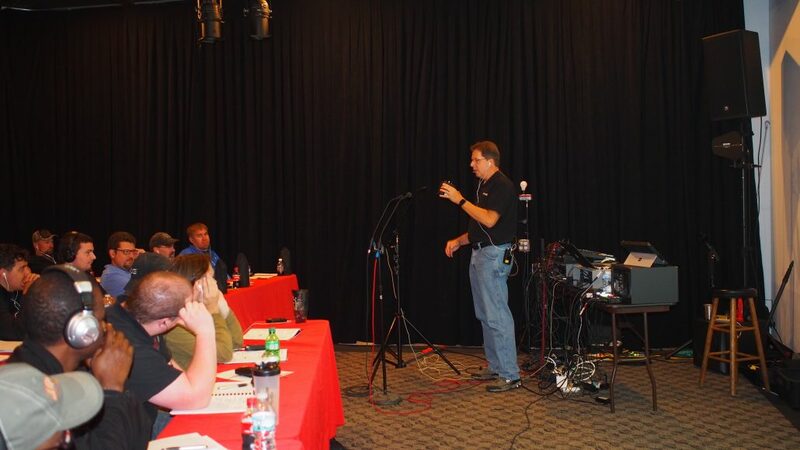 This was the best audio training I received in my career. B.T. Information and presentation were excellent. I would recommend this class for anyone in the audio world. I will be recommending this class for the rest of our team. M.P. The graphics in the course manual have real meaning in regards to the subject matter. M.W. Great seminar! Analogies were related to layman’s topics which help with the understanding. N.C.
Great knowledge, explanation, content and delivery. Pat really breaks down the material giving clear cut understanding. T.T. The seminar was excellent and gave a lot of insight. Brenda was excellent with the planning. I loved everything. C.M. Pat is an excellent presenter. Everything ran smoothly and I enjoyed the live demos. S. E.
I enjoy listening to first-hand knowledge from a true professional in the field. It’s a lot to take in as I try to apply the info to my venues. Well worth it! C.W. The demos, real-world ways to utilize this knowledge. I enjoyed networking with other professionals. I look forward to taking more training in the future. D.M. I really appreciate the opportunity to attend this class. It reinforced the principles that I have been using and opened the door to many others. K.K. Demonstrations were very helpful in understanding concepts for those unfamiliar with sound. No name. This training has paid off. I can’t tell you how much the Sound Reinforcement for Technician s training has paid off since I have taken the class!!! It totally blew away my expectations. I really enjoyed the class last week. I’m really looking forward to using the knowledge in our classroom audio designs. Both you and Pat should be proud of the work you do in putting on these seminars. The class was very entertaining, it moved alone well and was very informative. It totally blew away my expectations. Thanks again for a wonderful 3 days, I hope that I can attend another one of your seminars in the future. Pat was direct, engaging and dynamic. Pat was direct, engaging and dynamic. He was able to give us practical examples of real-life audio issues and easy-to-understand solutions. He held our attention through three 8-hour days of training. Bottom line, it was a lot of information and well-delivered. My interest and appreciation for the audio field has doubled. I had a great time and found Sound Reinforcement of Technician s seminar extremely educational. My interest and appreciation for the audio field has doubled. I’m excited to learn more and can’t wait to attend another SynAudCon seminar. I am leaving this class with the solution to a problem. I am leaving this class with the solution to a problem that I have been working on for months. I thought it was going to be an expensive fix, but I just didn’t have the correct information. My background is in IT. My background is in IT but I have been trying to jump start my knowledge in AV. I have come a long way on my own. Pat ability to tie everything together in 3-days has help me understand the different laws/rules/concepts. This class is awesome for anyone that has the ability to grasp technical details and has a strong desire to learn something new. I believe that I will retain 80% of the content presented. I can t wait to apply the information. Excellent Seminar! I learned a lot. I can’t wait to get home and apply what I have learned. I believed that I will retain 75% of the content. Thank you for keeping the class current. I took this course 8 years ago. I remembered some principles. I liked the changes you made to the class with the latest technology. It shows that you work to keep the class current and not just sit back and teach the same thing over and over. I believe that I will retain 70% of the seminar content. Pat applies it to real-world applications. Pat relates the material to real-world applications. There were many examples, I was able to take it back to some situations that I experienced. I believe that I will retain 80+ of the information presented. Audio Click Rule is a great value. The Audio Click Rule alone is a great value and resource. Pat is a great teacher. He has a way of teaching to a beginner and an advanced student. I believe that I will retain 75% of the content presented. From Singapore, worth the travel to the US. It was worth spending the time and the travel. Seminar Location: The seminar will be held at the Four Points Sheraton Phoenix South Mountain. Four Points Sheraton is conveniently located 10 miles away from Phoenix Sky Harbor International Airport. SynAudCon has a block of rooms at the Four Points Sheraton for the rate of $105. Please click here to make your reservations online. This room block will end on 3/11/2019. The $105 room rate after this date is not guaranteed. Amenities include: Free internet, free parking, heated outdoor pool, on-site restaurant – Rustic Cravings and more. Visit this link for taxi and shuttle information. Directions: Please type this address into your favorite map program. The seminar will be held in a meeting room “Rosewood-Ironwood” at the Four Points Sheraton. Seminar Times: The seminar will begin at 8:30 am and end at 5 pm each day. The doors to the classroom are open at 8:00 am. The class materials include: Full Color Manual, Certificate of Completion, 16 Renewal Units and an 1-year membership to SynAudCon. Meals: SynAudCon provides all-day beverage service and lunch.